For me, being a dentist is about making a difference for the people in my community. When a person has strong oral health, their bodily health is strengthened and when they have a smile they love, they have stronger self-esteem and confidence. Dentistry is more than working on and fixing teeth: it’s caring for the person and helping each as they achieve their dental goals. At the same time, we’re building a connection based on trust, respect, and communication. I was drawn to dentistry at a very young age. My father is a general dentist in Florida and I grew up watching him, and eventually assisting in his practice, as he cared for patients. I saw how he listened to each patient, respected their concerns, and helped improve their quality of life. I knew, early on, that I wanted to do the same. It is amazing to spend my days working alongside my wife, Dr. Emily Ruthven, and this remarkable team. 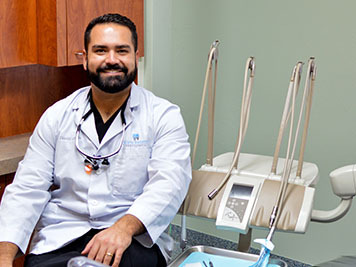 We’re united in our desire to provide the best dental experience, the strongest results, and most welcoming and supportive environment. Our patients respond to our warmth and friendliness, taking us into their confidences and sharing their stories. It’s amazing to care for everyone in a family, from the toddlers through great-grandparents, and be included in their lives. I cannot imagine a more fulfilling way to spend my days! I completed a Bachelor of Science in Biology at the University of Florida and then a Doctorate of Dental Surgery at Marquette University School of Dentistry. After graduating from dental school, I attended Wichita State University, where I completed a residency in Advanced Education in General Dentistry. This residency honed my skills and broadened my knowledge of general dentistry. Each year I complete a wide range of post-graduate continuing dental education courses. These classes keep me at the leading-edge of new techniques, materials, technology, and research, so I’m able to provide patients with the highest level of advanced care. I also attend meetings, lectures, and seminars, and read many dental journals, too. I grew up in South Florida and moved to Neenah, Emily’s hometown, after finishing my residency. This is a wonderful community; I’m enjoying getting to know everyone and exploring the area. When not in the office, I like biking and cooking with Emily, baseball, and spending time with family and friends.